FREE 16 Zone Receiver with every unit! Concord Express is a hardwire system integrating ITI wireless for the cost of a traditional hardwire panel. 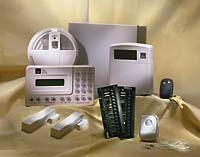 Even for typical hardwire installations, such as new construction, keychain touchpads and other wireless components add value to the system and profits to your bottom line.